Asus is expected to launch its fifth-gen ZenFone lineup at the upcoming Mobile World Congress in Barcelona. Multiple devices are expected to be launched at the event, ranging from flagships to entry-level models. One of these lower-end handsets that are expected to be launched at the event is the ZenFone 5 Lite that has now been listed on benchmarking site Geekbench, revealing some of its key hardware details. 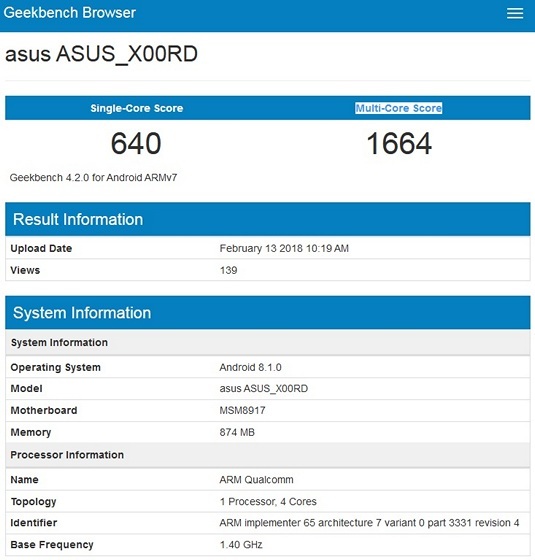 Listed on the Geekbench database as Asus_X00RD, the upcoming Asus device is expected to be marketed as the ZenFone 5 Lite. According to the listing, it will be powered by a 28nm Snapdragon 425 SoC (MSM8917) that comes with an integrated quad-core 64-bit Cortex-A53 CPU clocked at 1.4GHz, alongside the Adreno 308 GPU. However, the chipset only supports displays of up to 720p, although earlier rumors seem to have suggested that the device will ship will a 2:1 Full HD+ panel. The device will also apparently offer only 1GB of RAM, which is another of its disappointing aspects, given that even basic mid-rangers are now starting to come in 4-6GB variants. Interestingly, however, the device will also come with Android 8.1 Oreo pre-installed, which is more than what you can say about most devices even at higher price-points. It will be interesting to see whether the 1GB RAM threshold means the ZenFone 5 Lite will be Asus’ first Android Go smartphone. Either way, the device scores a lowly 640 on the single-core tests and an unimpressive 1664 on the multi-core benchmark, both of which are par for the course for the Snapdragon 425. The ZenFone 5 Lite was leaked earlier this month by tech journalist Evan Blass (@evleaks), who claimed that it will ship with quad-cameras. It is expected that the device will sport dual-camera setups on the rear as well as the on the front. According to Blass, the ZenFone 5 Lite is likely to have dual 16-megapixel sensors on the back and dual 20-megapixel sensors on the front side. Moreover, there’s also likely to be a selfie flash to improve low-light shots.